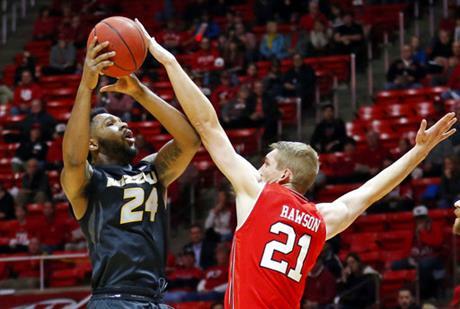 SALT LAKE CITY – The Utah Runnin’ Utes (3-0) wrapped up their three-game home stand with a 77-59 win over the Missouri Tigers (2-1) Thursday night at the Huntsman Center. Utah had five players score in double-figures and were led by senior David Collette’s 17 points overall. Senior Tyler Rawson chipped in with 12 points, freshman Donnie Tillman added 11 points, while both senior Gabe Bealerand sophomore Jayce Johnson tallied 10 each on the evening. Utah shot 46 percent from the field, which included a 32 percent effort from downtown, and limited the Tigers to a just a 34 percent effort on the evening. The Runnin’ Ute defense forced 14 turnovers that led to 17 points and blocked five shots on the evening. After both teams struggled from the field early, Utah got things going and ended the first half on a 12-3 run to take a 35-19 lead into halftime. Back-to-back 3-pointers from senior Justin Bibbins and Bealer pushed Utah’s lead to 45-21 in the second half and the Utes never looked back on the way to the 18-point victory. The Utes return to action next week competing in a pair of games at the MGM Resorts Main Event in Las Vegas. Utah will face Ole Miss in the opener on Monday, Nov. 20, and then take on either Rice or UNLV on Wednesday, Nov. 22. Tip-off between the Utes and Rebels is set for 9:30 p.m. PT/10:30 p.m. MT and the contest will be televised on AT&T SportsNet. • Collette matched his early season-high with 17 points. He was 6-of-7 from the charity stripe. • Bealer scored in double-figures for the second straight game, giving him back-to-back double-digit scoring efforts for the first time in his career. • Tillman led the way with 10 rebounds to notch the first double-double of his career. 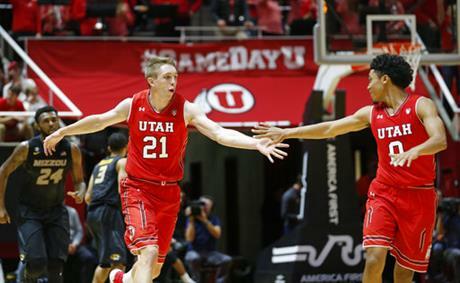 • Barefield led the Utes and matched his career-high with eight assists on the night. • Johnson made his season debut after sitting out the first two games with an injury, totaling 10 points, five rebounds and two blocked shots. • Utah yielded just six turnovers in the game – its lowest output since registering just six turnovers against California back on March 5, 2014. • Utah moved to 3-0 all-time against Missouri. It was the first contest between the two teams since 1978 and the first time a contest had been played on either of the team’s home court. • Utah moved to 15-19 all-time in games against an opponent from the Southeastern Conference (SEC). It was the first win over an SEC team since downing LSU, 91-61, back on Jan. 6, 2009. The Utes have won three straight over SEC opponents, with its last loss coming back in 2003 (at LSU, 51-65).